The dough is mixed to perfection. The baking time is just right. Now, it's time to remove the cookies from the oven and enjoy the bounty. Unfortunately, sticking can instantly spoil even the best batch of cookies. Lining your cookie sheets with parchment paper, which is coated with silicone to help prevent sticking, can make baking cookies easier. However, in certain circumstances cookies may still stick. Follow a few guidelines to salvage your baked goods. Remove the cookies from the oven when they are done. Lift the parchment paper off the cookie sheet or baking pan and place it on a wire rack to let the cookies cool before removing them from the paper. 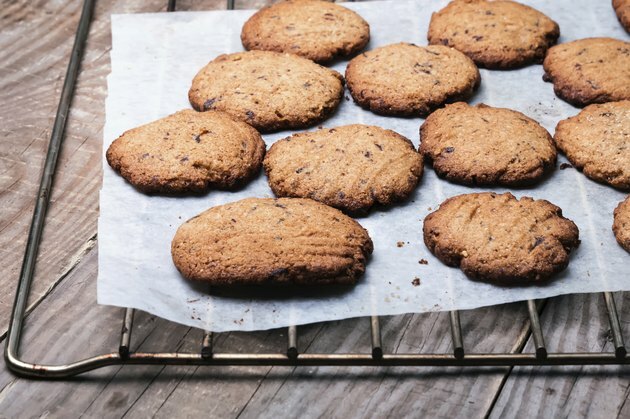 Cookies that are not fully cooled tend to stick, even on a non-stick surface such as parchment paper. Lift the parchment paper off the cookie sheet or baking pan. Place the paper with the cookies on it on a hot, damp towel. Let the cookies sit on the hot towel for several minutes. Gently remove the cookies from the parchment paper. Remove the cookie sheet or baking pan from the oven. Parchment paper effectively prevents most sticking, but there are exceptions. Heated ingredients such as sugar, chocolate chips and jelly can stick on any surface. Lift one end of the parchment paper and dribble a few drops of water onto the hot cookie sheet or pan. Lie the parchment paper back down. The steam helps loosen the stuck cookies. Use a wide, thin spatula or knife to pry stuck cookies off parchment paper. Slowly work the spatula or knife underneath the cookies. Gently run the spatula or knife under the entire surface and slowly lift up the cookies to prevent breakage. Parchment paper is a heavy duty material and it should not rip or tear during the process.